Electronic Arts (EA) has released Need for Speed Undercover for the iPhone and iPod touch. It costs $10. Take control of high-performance sportscars like this Lamborghini. 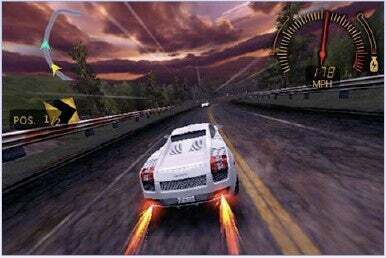 Need for Speed Undercover marks the debut of the hugely popular racing game franchise on the iPhone and iPod touch. It puts you in control of 20 of the world’s best known high performance exotic production cars, ranging from the Porsche Carrera GT to the Lamborghini Gallardo. Each car features unique style, performance and handling characteristics — steering, cornering and acceleration. The game features 24 missions that, when completed, lead to other secret missions. You have to outrun the cops and other racers as you participate in eight different race modes like Highway Battle, Sprint and Cop Takeout. If you do well, you’ll earn performance upgrades like Boost, Speed, Acceleration and handling. System requirements call for iPhone 2.2 software update.